Ah the flea market! Is there a better place to be early in the morning? All the treasures of popular culture seem to find their way there sooner or later. Armed with a few bucks in your wallet, a little knowledge in your head, and a pinch of luck, you just might come home with something that you never even knew you wanted and yet now you can’t live without. Such is the lure and the magic of the flea market. What may look like tables full of junk to the uninitiated is actually treasure waiting to be discovered for those of us lucky enough to be a part of this world. My most recent outing to my favorite flea market yielded a happy assortment of goodies at very reasonable prices. No, I didn’t come away with a copy of the Declaration of Independence or anything else that will make me a millionaire – but there’s the always next time. Let me share with you my most recent finds. First is this little Toby jug. Most collectors of comic memorabilia don’t know who this guy is today, but a hundred years ago “Foxy Grandpa” was one of the most popular comic characters out there. There was even a Broadway play about him in the early 1900’s. The cost of this little item was $5.00. Second is this wacky heat mask designed so that you can wear it and watch TV at the same time. Complete with the box, instructions and in working order, this crazy piece of 1950’s nostalgia also set me back $5.00. 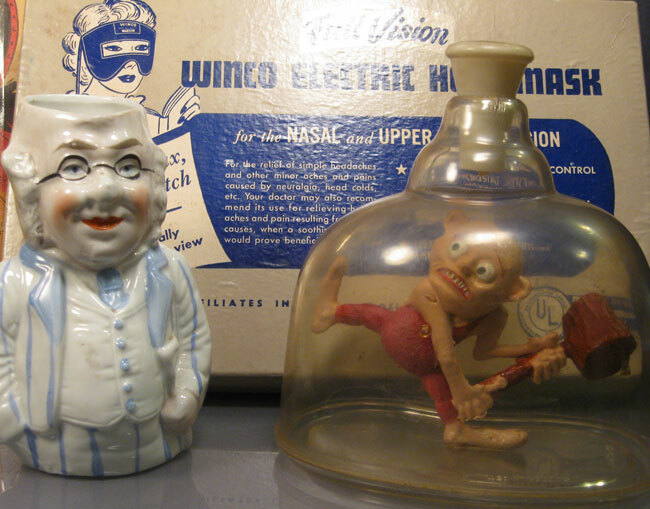 Just about everybody’s favorite find for the day was this strange little man trying to break his way out of a bottle. Marked on the bottom “Marvin Glass Creations” and dated 1965, we found out that he was part of the “Bottled Emotions” series. Go and try to find another one. He set me back $15.00. This ceramic vase is part of the “Blue Ridge Mountain Boys” series by Paul Webb. It’s profusely marked and dated 1946. With no cracks or chips, this was $20.00. 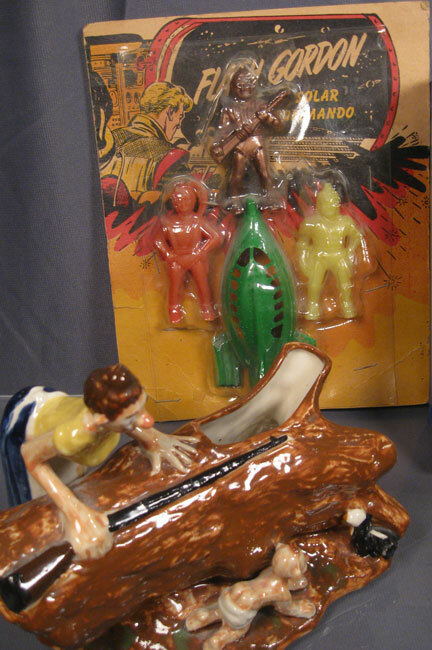 Finally, there’s my carded “Flash Gordon” play set from the 1950’s. Space and the fifties is always a good combination – $25.00. All I can say is that if I have to explain it, you wouldn’t understand. 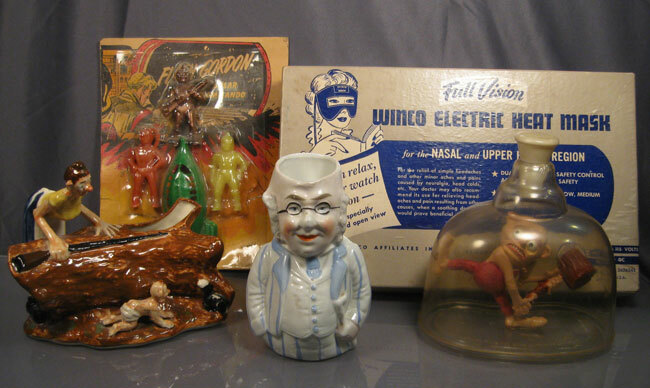 This entry was posted in 1910's, 1940's, 1950's, 1960's, Americana, Comic Characters, Humor, Jim, Toys, Weird. Bookmark the permalink. I am certainly not the last word on Paul Webb pieces but the ceramic figures and planters seem to bring around $25 to $35 based on my experience. I also have some carved wood pieces that I would probably value a little higher. There are calendars out there too. Unfortunately there are not more people familiar with Paul Webb these days and I think the value has dropped from what it was a few years ago on his items. They are really unique though.